The world-famous Mysuru Dasara attracts lakhs of people from across the globe, but it is undoubtedly the Jamboo Savari procession, which adds to the allure of the entire festivity. The world-famous Mysuru Dasara attracts lakhs of people from across the globe, but it is undoubtedly the Jamboo Savari procession, which adds to the allure of the entire festivity. Twelve tamed and amiable elephants from four camps of Karnataka get the privilege of walking the majestic procession every year. But only the best and strong ones make it to the list of final 12. A team of forest officials and a veterinary doctor shortlist the elephants after keenly observing their height, weight, health, skin, tusks, age, and above all, the behaviour. The behavioural study includes their relationship with mahouts and kavadis, their ability to carry weight and climbing lorries, response to sound and panic behaviour. The 45-day training begins for the jumbos—most of them are more than 30-year-old since they are capable of performing tasks easily—a month before the Dasara celebrations, to acclimatise them with city roads. Arrangements for a customised nutrition are made at the temporary sheds erected on the Mysuru Palace premises. While mahouts keep an eye on them, the kavadis give them bath. Every day, the elephants are taken out around the five-km stretch of Raja Marg to make them familiar with the noise and crowd. Arjuna is made to practice carrying a sandbag and a wooden howdah. The weight is gradually increased from 200 kg to 800 kg during training. Akram, a forest staffer who has been working with elephants for the past 19 years, is responsible for placing the golden howdah on Arjuna’s back on the D-day. “I make Arjuna practice twice a day for two hours. After the walk, all elephants are given a hot water bath and massage,” he says. Then comes the time for food, which is prepared by a group of seven people. Each pachyderm is given a mixture of tender coconut, jaggery, salt, dry paddy straw; and a mixture of groundnut oil cake, boiled rice, green gram, black gram, vegetables (radish, knol-khol, onion, carrot, cucumber, beetroot), green grass, paddy straws, and banyan branch fodder. In case an elephant suffers from diarrhoea or stomach pain, the vet changes the diet accordingly. While forest officials oversee the training and staff takes care of food, the vets observe their behaviour and reaction to objects and sounds. 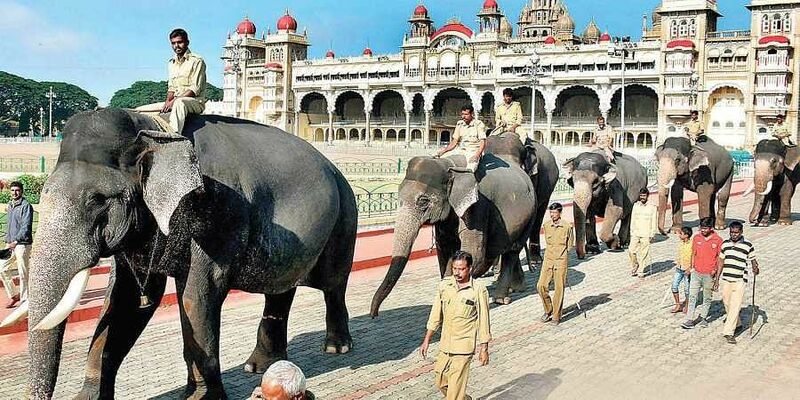 Veterinarian Dr Nagaraj, who has been looking after the Dasara jumbos for the past 19 years, says, “We study them thoroughly during practice sessions. But we can’t predict their behaviour as they can get disturbed on seeing a person or incident. Once we had to drop an elephant on the procession day because he was nervous.” Pregnant, lactating or injured animals are not selected. ❖ Mathigodu Elephant Camp: Balarama (60), Abhimanyu (52), Drona (37), Varalakshmi (61). ❖ Bandipur Elephant Camp: Chaitra (46). ❖ Balle Elephant Camp: Arjuna (58). Dasara elephants usually retire by the age of 65, which means Arjuna may carry the howdah for eight more years. The next lead elephant is said to be Dhananjaya. While other elephants in the race are Gajendra, Drona, Abhimanyu and Gopi. ❖ Captured from Kakanakote Forest Range in 1968, Arjuna, which weighs 5,650 kg, has been carrying the golden howdah since 2012. ❖ Balarama, which carried the howdah 13 times (1999 to 2011), has been part of Dasara till date. `34 lakh, while each mahout and kavadi are insured for `1 lakh.